This simple vegetarian and vegan recipe uses store-bought salsa and taco seasoning to make a super-quick ten-minute vegetarian taco filling from TVP. TVP, also known as textured vegetable protein, which is a vegetarian and vegan meat-substitute product. If you're new to vegetarian cooking or just have never used TVP before, this is the recipe you'll want to try for your first time since it is simple, easy, quick, and foolproof, and also results in something beloved and familiar: tacos! Be sure you have the smaller TVP "flakes" which are about the size of your pinky finger nail, and not the larger "chunks," which are about an inch round. The TVP makes for a great meat substitute for vegetarian and vegan tacos, as it has a texture similar to shredded chicken when cooked and, as a bonus, it takes just a few minutes to prepare and is a bargain at the grocery store. Wrap up your vegetarian (and vegan!) TVP taco mixture in a flour tortilla or stuff it into a hard shell with lettuce, tomatoes and beans and whatever else you like on your tacos: cheese (or vegan cheese), salsa, hot sauce, guacamole, sour cream (or non-dairy sour cream) or avocado slices. Like making simple homemade vegetarian Mexican food meals? Browse more of my favorite easy vegetarian and vegan Mexican meals for busy weeknights, and, of course, plenty more vegetarian taco recipes to try! Enjoy your super easy and quick homemade TVP tacos! First, in a large skillet, heat the water over medium heat. Once the water is hot, add the TVP, stirring well. Allow the TVP to reconstitute for 2-3 minutes until fully tender. Keeping the pot over medium heat, add the olive oil or vegetable oil and soy sauce, then the cut bell peppers and taco seasoning, stirring well. Allow the mixture to cook for another 3-5 minutes, stirring frequently. Next, mix in the salsa and remove the pan from heat. 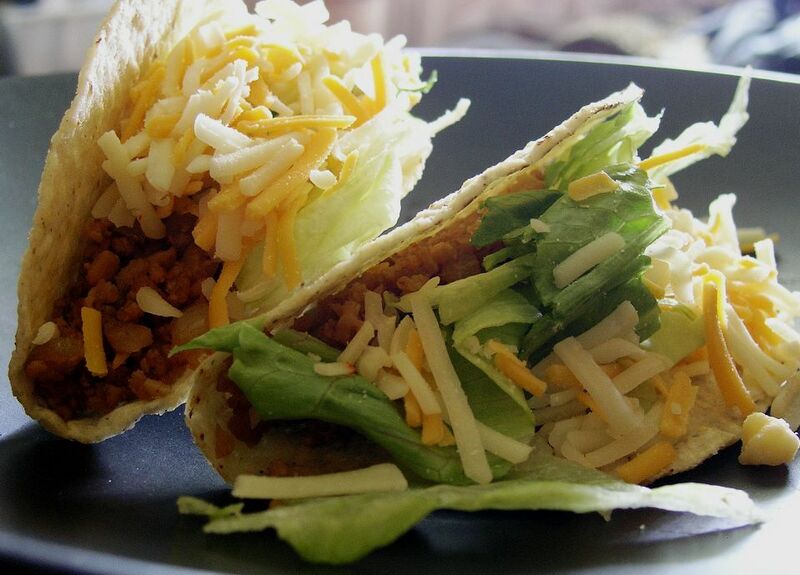 Serve your quick and easy TVP taco mix wrapped up in a flour tortilla or hard taco shells. I like to eat this as is, but you could also add tomatoes, lettuce, beans and sour cream to your tacos.